Long-time users of PRXPARSE in SAS will notice that I did not apply the common practice of wrapping PRXPARSE in an "IF _N_=1" condition. For several releases of SAS, it's been the case that when using a constant parse pattern the DATA step will compile the regular expression just once. Parsing the expression hundreds or thousands of times across each DATA step iteration would be a performance concern -- but since in our case the pattern never changes, SAS compiles it just once. Thanks for the mention Chris! Good article. And I learned a new thing: you no longer need the "if _n_=1" construct any longer which will simplify my code from now on. It also shows that, to be a good coder, you need to be a life-long learner. Otherwise your knowledge will go stale without you realizing it. 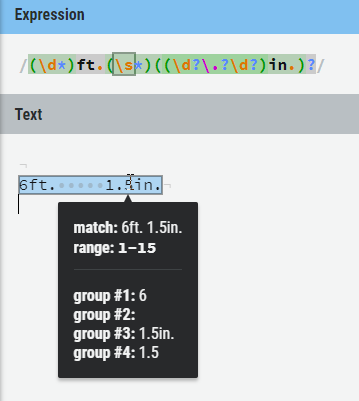 I am confronted with other peoples code on a daily basis and there is no shortage of examples where regular expressions would eliminate complex and lengthy sequences of other text functions. Spread the word! I agree -- once you begin seeing solutions in "regex" -- it's difficult to stop seeing the possibilities. Pro tip: always pepper your regex code with comments. Deciphering even a moderately complex pattern later is challenging on its own. I knew there were some holes -- would love to see an improved version! Maybe you can put that REGEX "stuff" into a user-defined function. As well as user defined functions, Rock Langston also packaged regex so that these could be at the heart of a user defined informat.